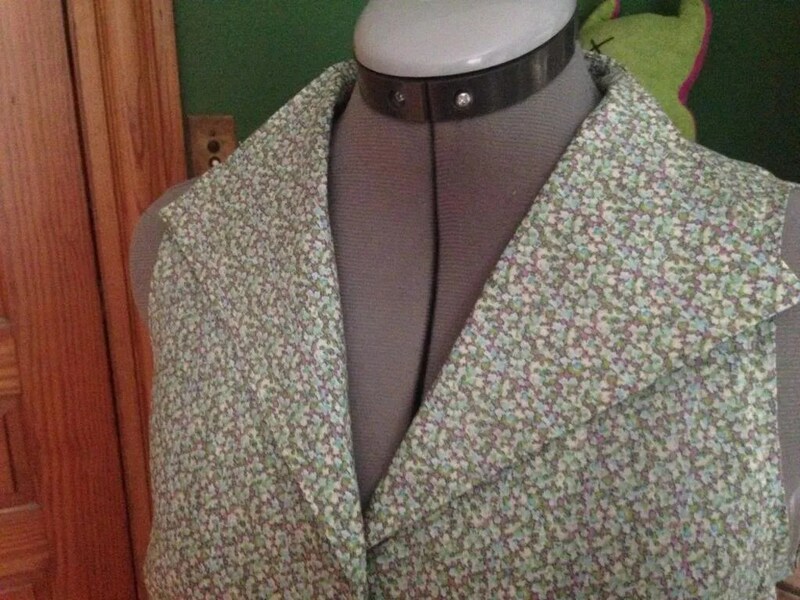 Fabric: Liberty tana lawn, 1 yard and a mystery poplin used as sew in interfacing on the fronts. As you can see, there is no back collar. The fronts simply fold over. I used a fairly crisp interfacing, and I edge stitched the whole thing in an attempt to make it look less homemade, but in the slightest bit of wind the collar will blow together. The shirt only calls for 4 1/2 inch buttons. I feel that is insufficient, causing the rippling effect above. The facings are also extremely wide, and they do not want to stay in place. Note that the collar looks strange here – it’s just not possible to get it to lay gracefully on a human body, which is not as regular as a dressform. I used a bias binding on the armholes rather than facings. I think this was a good choice, because the armholes are huge even after I removed 1/2 inch from each. The binding does show when I wear it, if I ever move my arms. This is not my finest binding job, because I did it last and I kind of knew it was a wash.
It’s wrinkled here because I had worn it for a few hours. 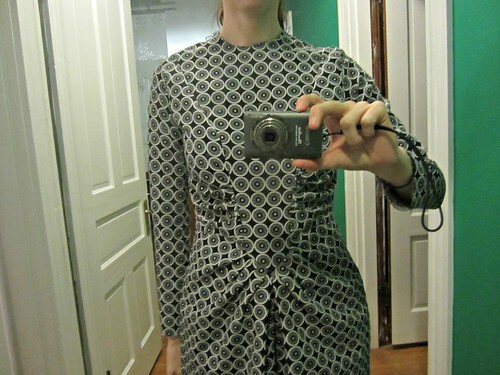 I don’t know if you can tell from the dressform, but this pattern is very wide at center back. I think that might be part of the issue with the collar. I would eliminate the shoulder darts entirely, and probably narrow the whole piece. I actually have a broad back, so I think this is strange. At most, I occasionally remove darts that are meant to compensate for a rounded back, as I don’t have one. There are 12 darts in this shirt, but I think it could have fit better with less. I don’t know, there’s just something really off about the draft. And I know, it does come with extensive instructions on tissue fitting and alterations, but the basic pattern should be better. I also don’t like tissue fitting. I’ve done it, but I’ve never felt it told me much of anything, so this time I just blended sizes and went for it. I’m not upset about the fabric, since it’s not the best color on me anyway, but I am disappointed in the lost time. One thing I did learn: be sure to use a short stitch length (1.8-2.00) on Tana lawn, or you will get oddness. Oh well – these things happen! On to something different, maybe a nice blouse with no buttons? Size: I cut a 6 in the bodice, graded to a 10 at the waist. I should have cut at least a size smaller. My measurements are 33-28-39. It’s been a long time since I made a Colette pattern. They haven’t always fit me well, particularly in the back, but I decided to make this one anyway. I made a small bust adjustment of 1/2 inch on the bodice. I did not make any other adjustments to the pattern. I did blend a 6 on top to a 10 in the waist. As it turns out, that was too big, and I should have probably made a 4 and a 8. I’m always worried about things being too small, and inevitably cut a size larger. I took it in at the side seams, but I think it could use another inch at least. I used a hong kong seam finish on the entire facing, and I finished the hem and armholes with contrasting bias. I made the bias of some random quilting cotton in my stash. I think I’m going to buy an edge stitching foot – that collar stitching is just not as neat as I would prefer. I think this is a great pattern. 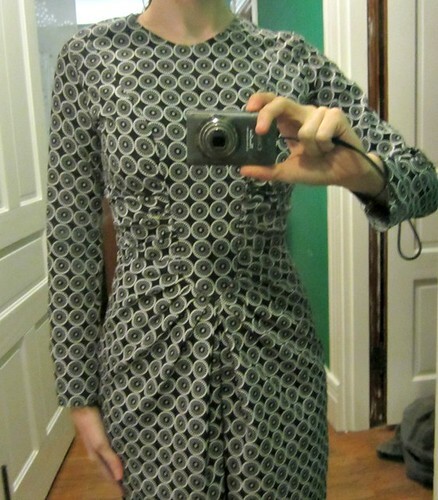 It came together more easily for me than other Colette patterns, and it fits pretty well with only a SBA. I would make a few adjustments if I make it again. I would cut a smaller size, and I would raise the waist by at least an inch. I can’t wear a belt with this dress because the waist is so far below my natural waist. If you are shortwaisted like me, that’s something to watch for. It’s also perhaps a little big in the back – I don’t think I need the back darts to be quite so full. This is a common issue for me with this pattern brand, I had just forgotten about it! I did not make a muslin, because I don’t have the patience right now, but it still turned out well. 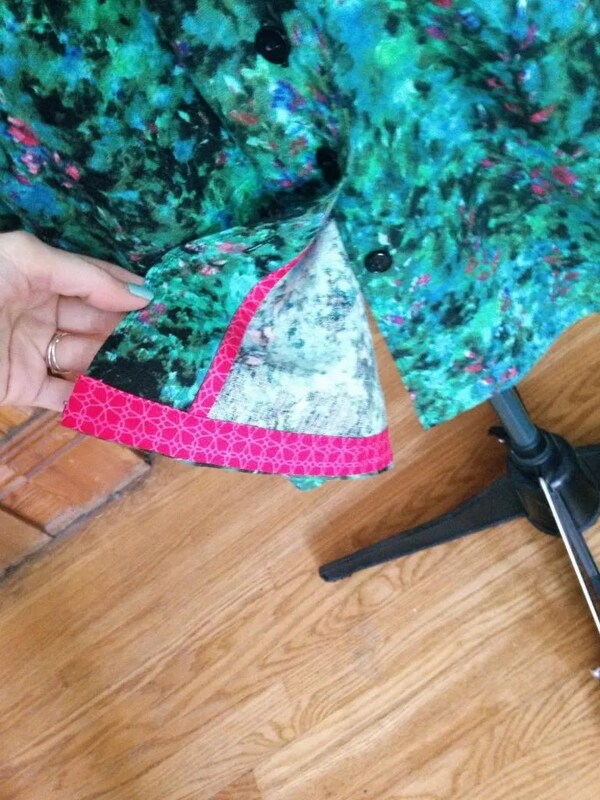 As always, I’d recommend sewing the side seams last in order to fine tune the fit. That’s saved me on a number of occasions! The pattern instructions were generally good. 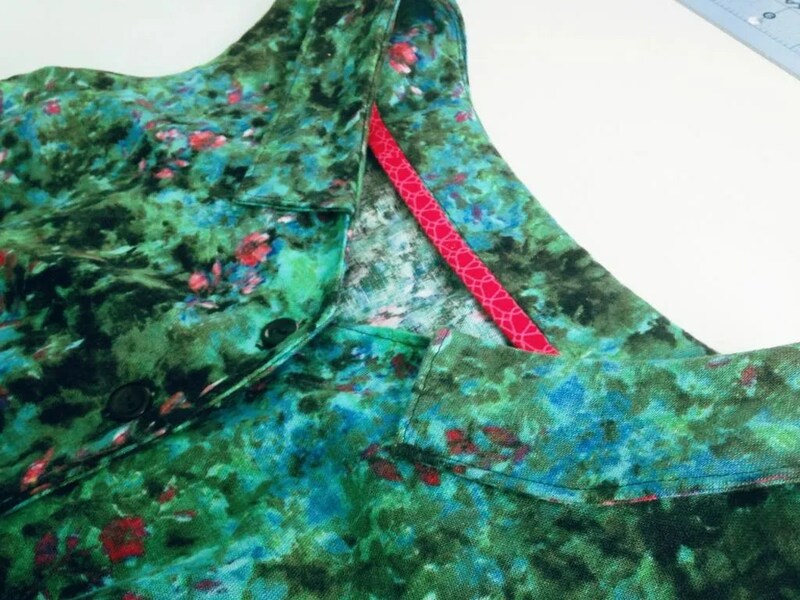 There is an error in the printed version of the dress on the collar – you must sew the collar to facing using a 1/4″ seam allowance on the front short edges only. Otherwise it will not line up. I used sew-in interfacing, and while there are a lot of layers at the collar I was able to trim. 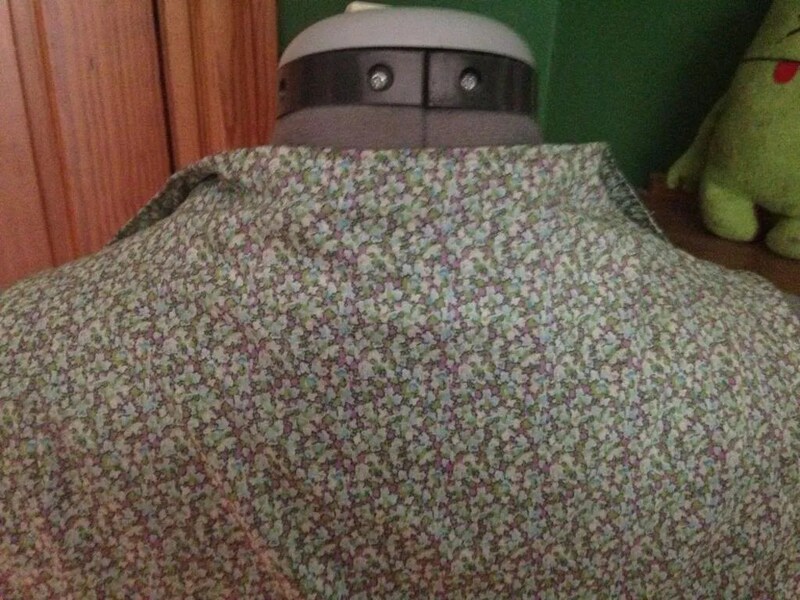 I used a clapper with lots of steam to get the seams flat, and then at the very end I sewed the collar to the dress at the shoulder seams to prevent rolling. This is not in the instructions, but I would recommend doing this step. So, overall I recommend this pattern, and I may make the sleeved version come fall! So, I guess I’m back! The musical was brilliant, and I’m so very proud of all my students. Next spring I hope to produce another! Now that I’ve done it once, perhaps it will not consume my life. I wouldn’t want to do anything else, and I am so very happy with my career! But now I have a few months off, so I’m back to sewing again. Well, I had to kick my husband out of my sewing room, which he had turned into a LEGO construction room, but never you mind. 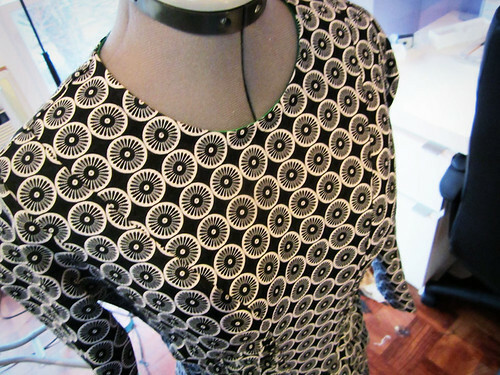 I decided t0 start back with this pattern, a Lisette dress in a very retro style. I bought this fabric at Joann’s, and I’m not sure of the content. My guess is rayon/poly/cotton. It does like to fray, but it will hold a press. 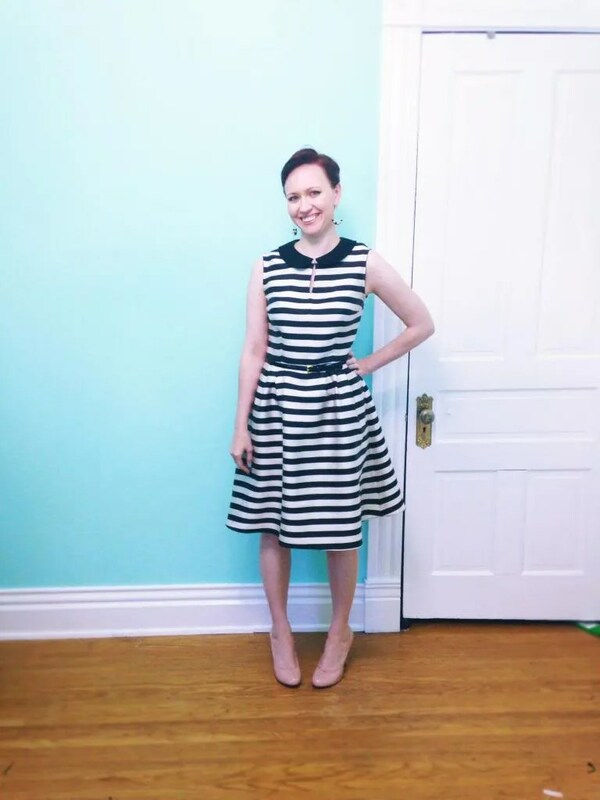 I have wanted a striped dress for a few years, so I was happy to make this one! I cut a size a size 12 in the bodice, blending to a 14 in the waist (my measurements are a 28″ waist and 33″ bust, if that helps anyone!) Honestly, the waist is a little big, but I don’t like things that are tight, so I’m happy with it! 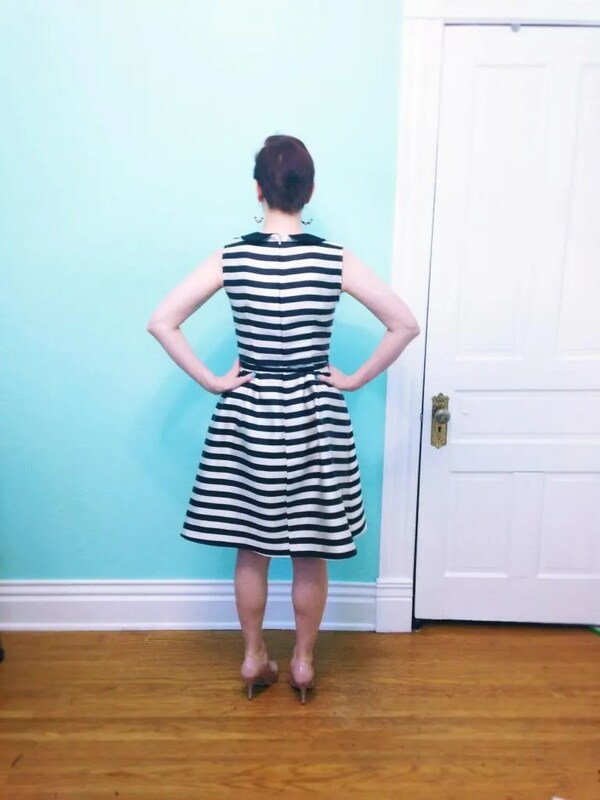 (I am very proud of my stripe matching – not perfect on the skirt, but excellent in the bodice!) So, the instructions direct you to interface both the collar and the facing. This results in a lot of bulk. It then asks you to place the edge of the zipper tape at the seamline, and to later fold the tape over the seam line and tack it down. Quite frankly, that’s a lot of bulk, and I would recommend interfacing only the facing, and finishing the zipper with a hook and eye to close. 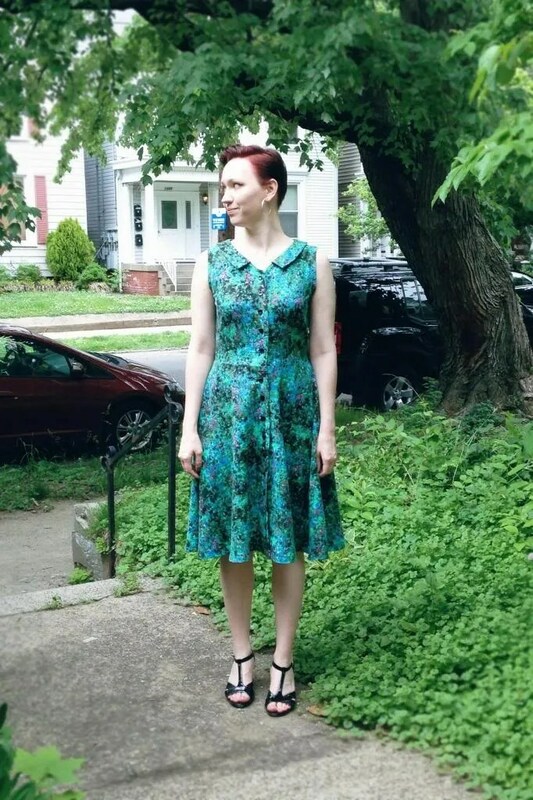 I decided that I would rather just hand sew the neck together, so my dress lacks the button and loop called for in the pattern. But really, thank you, and I hope I haven’t been forgotten! I am seeing this high/low hem tops everywhere this season. I made one last year, which didn’t turn out so well. 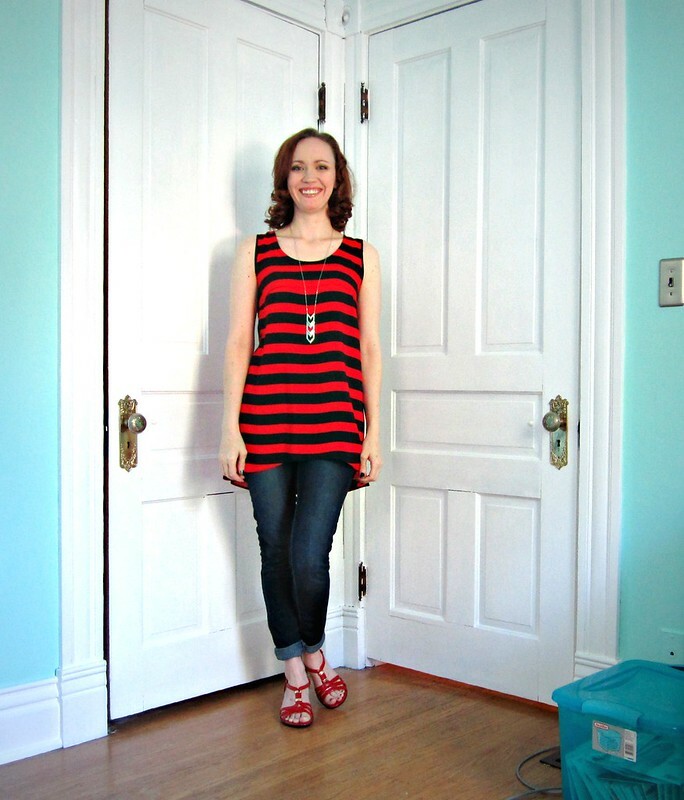 I didn’t like how much longer that top was in the back – I prefer the more gentle rounded hem of this pattern. 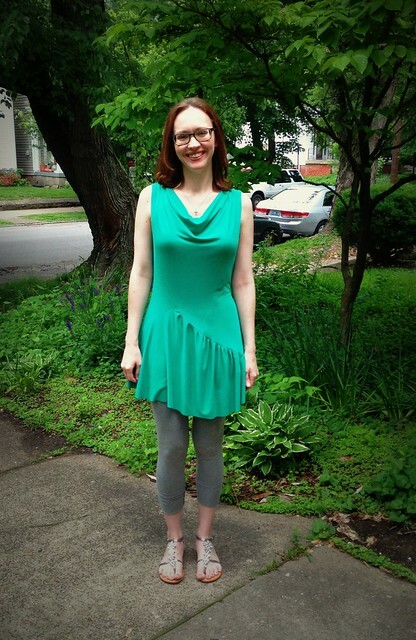 I also think rayon challis is a much better choice, as it allows the pattern to drape naturally. Because my torso is incredibly long, I haven’t found any hi-lo tanks in the stores that fit me. They all cut off in the front at precisely the widest part of my hips, and I don’t find that flattering on me. I knew I would have to lengthen this top, so I added 3 inches in cutting. I was worried that was too much, but it turned out to be just right! 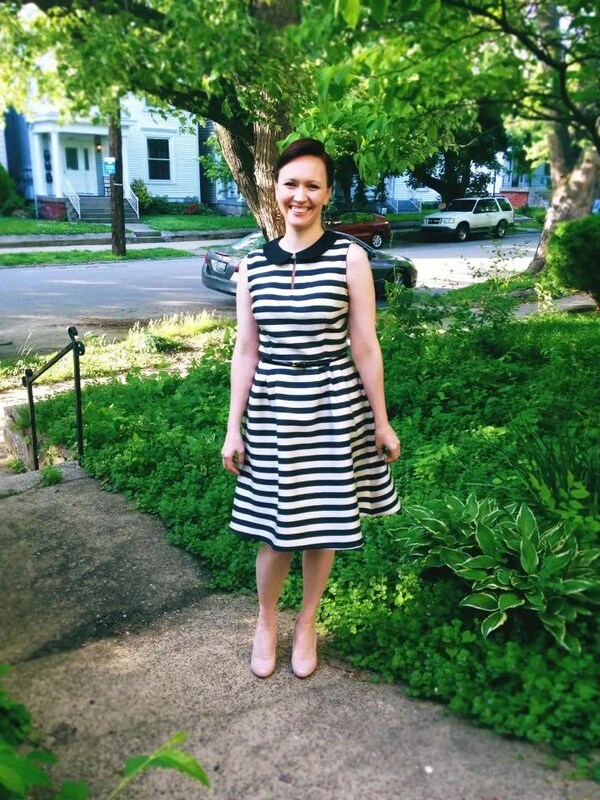 I was really excited to use my striped fabric – I’ve had it for ages, but it was too overwhelming for a dress. 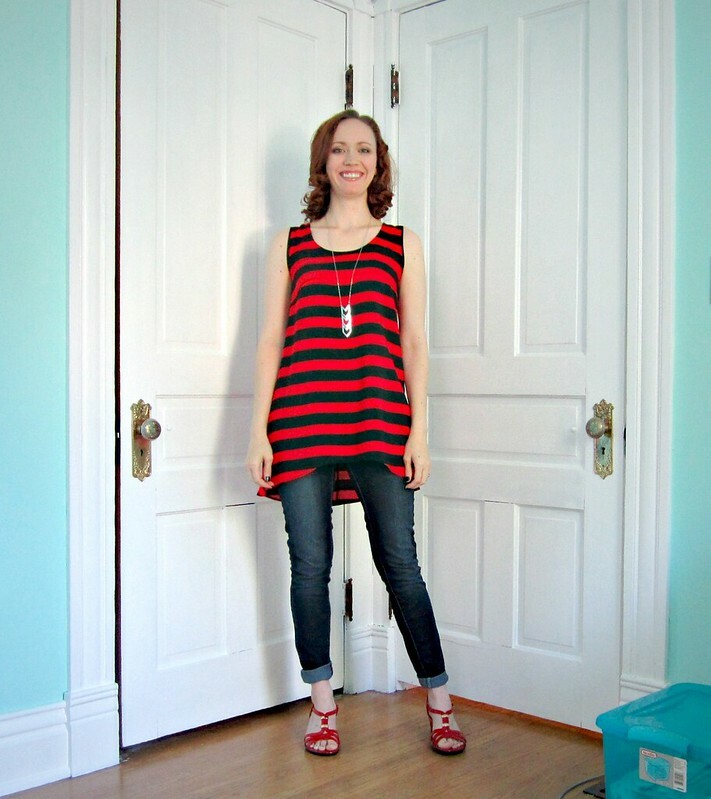 Imagine my dismay when I realized that the piece was actually vertical stripes! No matter, I cut on the cross grain. In fact, in order to get the stripes to line up I had to cut the yoke entirely off grain. Luckily, that doesn’t seem to have caused any issues, but I’m sure it would in a more fitted top. 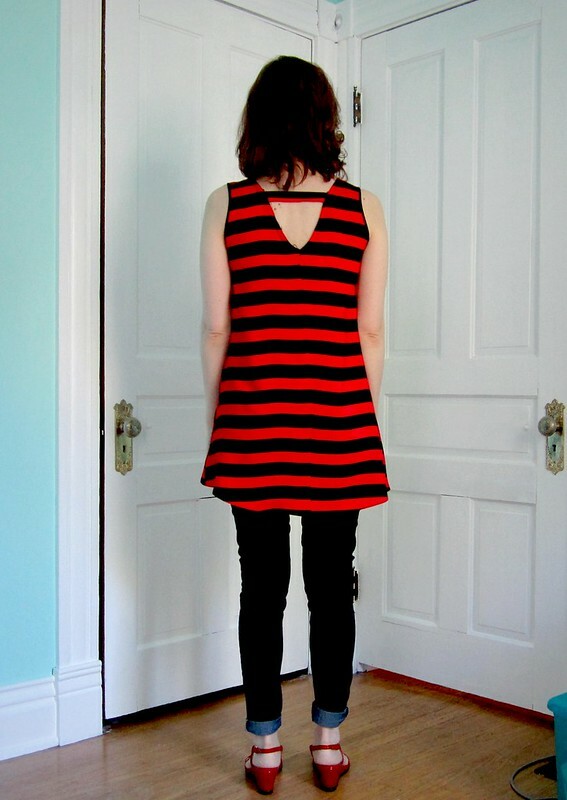 I am exceedingly proud of the back seam matching – I can’t even see it, can you? On the subject of the pattern – it was generally pretty good, though I had one issue. The pattern has you staystitch the neckline, but unfortunately the front neckline has a 3/8″ seam allowance, which isn’t marked. Be sure to keep in to a quarter inch or it will show and have to be removed! I think the pattern wanted a hidden bias finish, but I wasn’t thrilled with that on the neck. The armholes have visible black binding, much neater imo! In all, a very successful top. 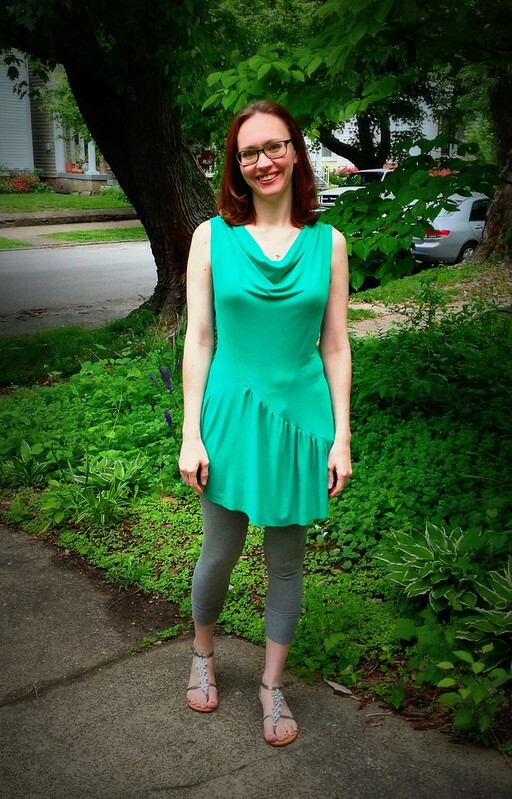 I’m not done with tops for the summer, but I need to pause to make dresses for a few events I have coming up… look for that soon! I always wonder how companies choose the view they will sew for the pattern envelope. 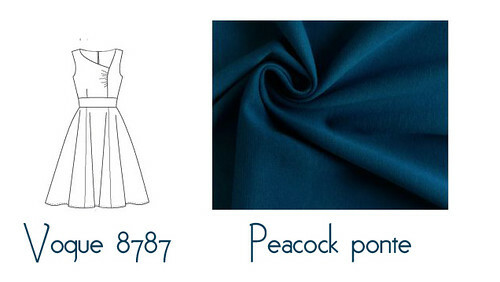 In the case of Vogue 8866, they chose the simpler version (you can see it in the link above.) If I hadn’t clicked through to look at the illustrations I would have never known about this version, and I would never have bought it for the plain t-shirt view. I loved the skirted version. Yes, ok, it looks a little like a dance costume, but so what? I love dance costumes! In fact, this particularly reminds me of a green number I wore while doing a dance to “The Sign” by Ace of Base. Yes, it was probably twice as dorky as you are imagining in your head. Let’s talk fabric choice: I actually think this would be nicer in a more stable knit. 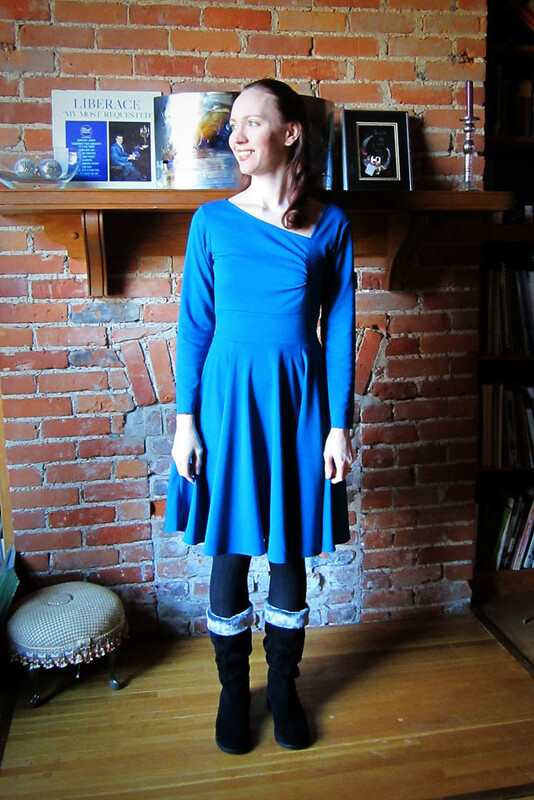 I used a medium weight bamboo jersey because it’s what I had, and I didn’t want to buy any new knits before using some up. Bamboo jersey is heavy and stretchy. 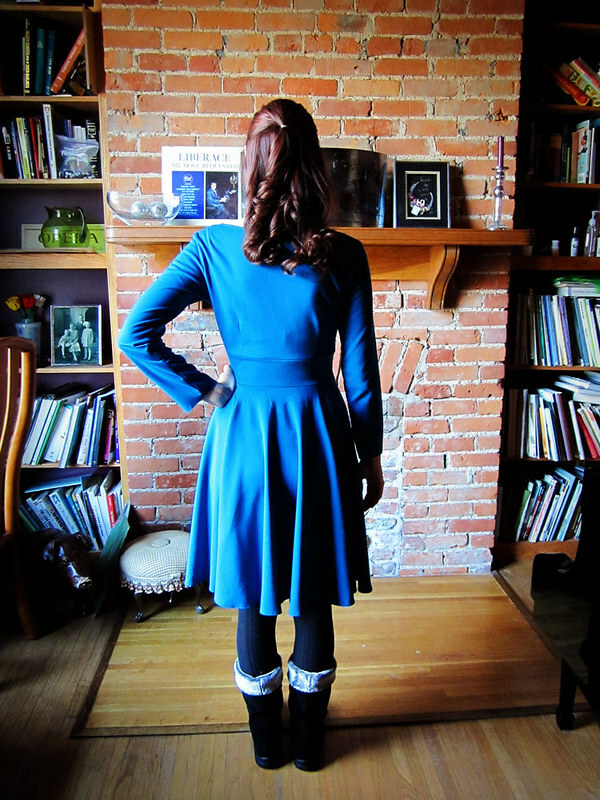 I stabilized the shoulder seams, but it does still stretch out (especially in the back – the skirt is heavy!) I think a ponte would work, or an interlock. On the right hand side you can see the waist of my leggings through the knit, which is one of my pet peeves. I will have to think carefully on what I wear underneath. I’m on a roll with tops – I have one more to complete this week! I’m trying to get in my summer sewing this month, because I know when classes start in June I will have less time. I’m not usually drawn to asymmetry. I generally prefer both sides of my neckline the same, because I fear looking like a kooky artist (even if that’s what I am!) I really liked this pattern though. 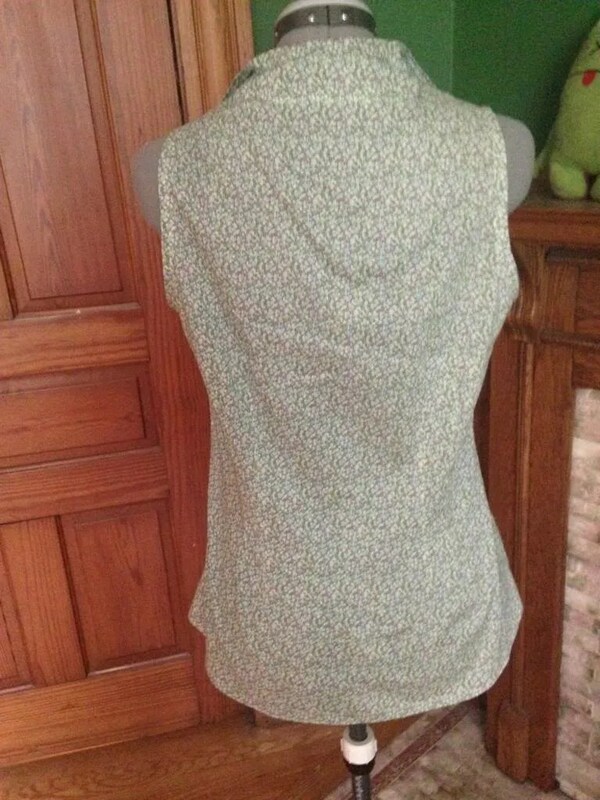 I was going to make the version with the drape neckline, but I decided to try something different. 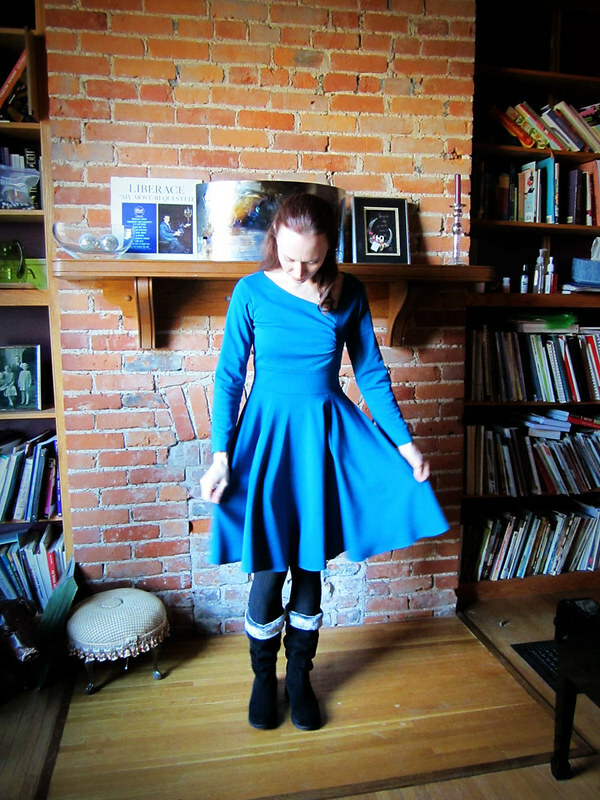 Happily, I think it turned out well – I really like this dress! After sewing on the bias (and stretching the corner apart to sew a straight seam – similar to a v neck) I pressed the seam towards the facing, rolled the entire facing to the inside, and topstitched 1/4 inch away from the edge. I then trimmed the leftover facing right next to the facing on the inside. I’ve done this treatment several times (I’ve made several Vogue patterns that use it.) It isn’t neat looking on the inside like a traditional bias binding, but it is faster. And I’ll be honest – if I know the insides will not show, I will worry about it being sturdy, and not really care if the edge still showing. Ponte doesn’t ravel, so it doesn’t require seam finishing. I cut a straight size 8 with no alterations. I considered taking some width from the underarms, as they are a little loose, but I decided that I valued the comfort of the dress. I also omitted the center back zipper and cut the pieces on the fold. It is a little tight to get into, but it’s fine once it’s on, and I’d rather not have a zipper in a knit. I have not hemmed the sleeves. I have long arms, and I like where they are now. I will probably leave them that way. One final thing to be aware of – you cannot wear a normal bra with this neckline. I’m wearing a strapless, and I’m fine with that, but it will expose any straps. Overall I highly recommend this pattern. I think it’s different enough to be fashionable, but it’s comfy (in a knit) and easy to construct. 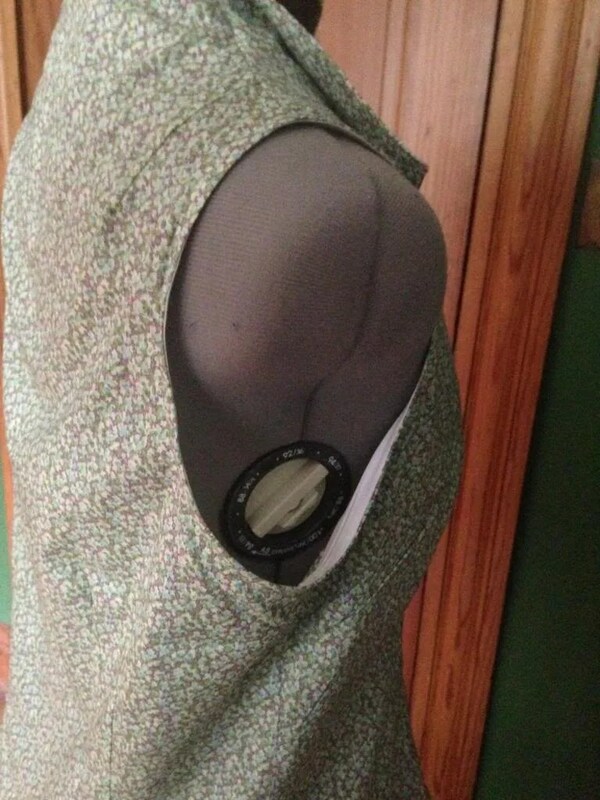 I want to go ahead and make that other view – wouldn’t the drape neck look lovely in a black ponte? 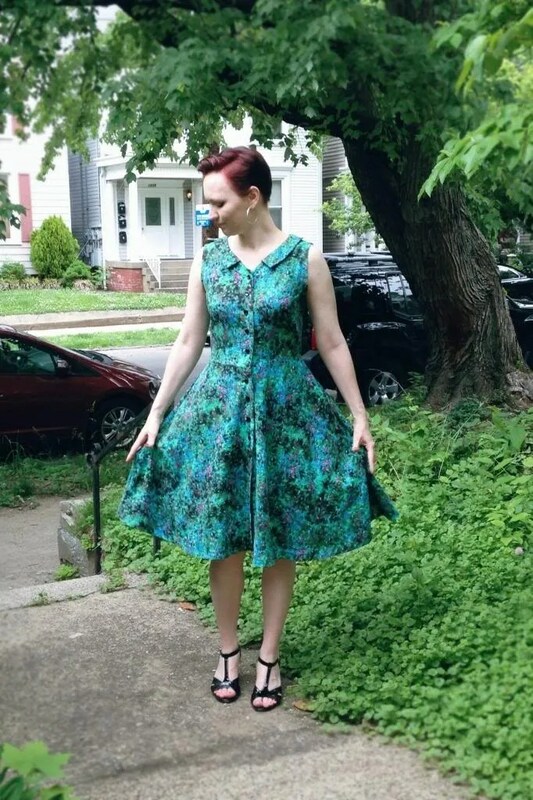 Simplicity 1777: why 40s patterns aren’t for me. 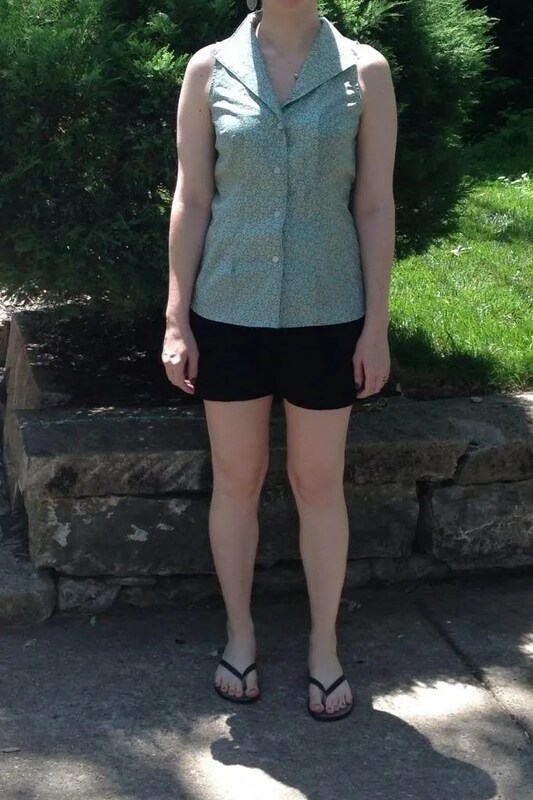 Pattern: Simplicity 1777, reprint from 1943. I loved this pattern at first sight. I haven’t made a lot of 1940s patters, and I thought it might be a good choice for me. I had a few concerns about the neckline, but I decided to give it a try. I cut a size 8 on the top, and a 10 on the bottom. I was expecting the center panel to be irritating to sew together. It wasn’t really that bad, but it does make for a bit of bulk in that area. My fabric is medium weight – in a light weight I’m sure it wouldn’t matter. I opted not to interface the panel, choosing to underline instead. My interior may not be as neat, but it’s less bulky! The skirt is much better, and I like the neckline. The sleeves were still tight, and I had taken too much from the bodice, so I let the bodice back out a little and let out the sleeves are much as I could. I sat down to sew the final seams (up until this point it was all basting!) and that’s when tragedy struck! I was finishing a seam allowance on the serger when my serger managed to grab part of the skirt and cut a nig hole in it with the knife before I could stop it! I know you can repair a hole with interfacing, but I didn’t think it would look good – it was right in the middle of the back, and it was noticeable. I decided to just shorten the skirt. Unfortunately, now it’s too short. I mean, it’s wearable, but I know I wouldn’t feel comfortable in it. I don’t really wear skirts that are shorter than 2 inches above the knee. The neckline is also finished with a strip of the cotton as a bias binding. I made one New Year’s resolution I didn’t mention, and that’s to stop putting in neck facings unless they are completely sewn down. 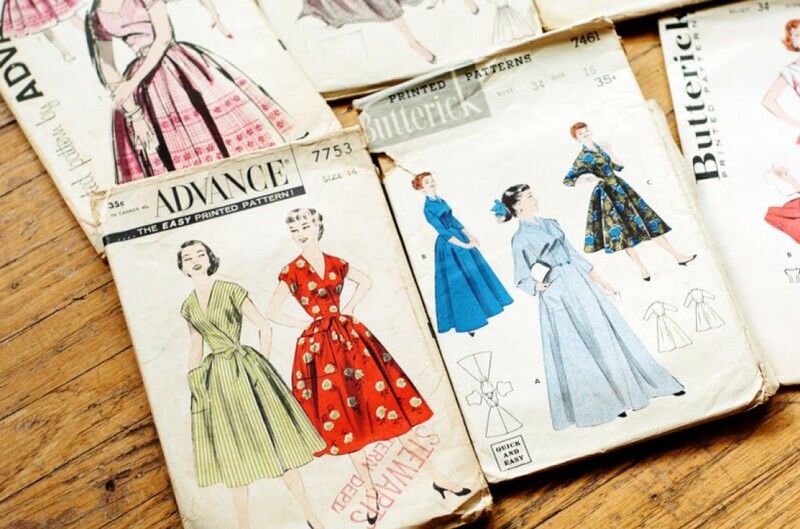 In cleaning out my closet this year I noticed that the dresses I didn’t wear all had one thing in common – shoddy facings (is there any other kind?) I have a few dresses I want to take the facing off and replace with a better method so I can wear them without fear! 1. The arms are small and short. I have long arms, but not that long. The sleeve length was so short that the sleeve darts ended up in the wrong place, contributing to the tight sleeve issue. I would cut a size up in the sleeves, possibly even two sizes up. Maybe that’s just the nature of long sleeved woven dresses? I’m pretty sure that’s why I don’t make them! 2. There is a lot of bulk at the waist. I would either use a lighter fabric (such as challis) or opt to leave out one of the center panel layers. The pleats are also bulky, so be sure to trim them down! 3. The neckline is higher than you think. Picture the highest neckline you can. Then add an inch. Now you might have an idea! I dislike high necklines because of my irrational belief that it makes you look like your head is on backwards. I redrew the front only, as I had already sewn the zipper, and I would totally redraw if I made it again. I didn’t try the v-neck, because it looked like a pretty high cut one, which isn’t better on me. 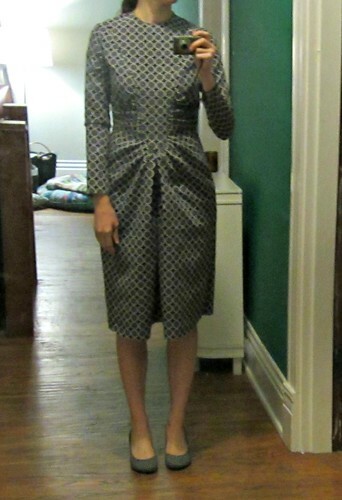 Ultimately I think that while I enjoy 40s patterns, they never look as good on me as some other eras. All the pretty draping and ruching never looks right for some reason, and they don’t have the fuller skirts that I love (I know this is due to WWII era fabric restrictions). I feel like gathering around a bodice just adds bulk to my waist, and I don’t have an enormous difference between my bust and waist anyway, so I like to emphasize what I have. This style makes me look a little boxy. I never think of that when I’m sewing, but occasionally I’ll end up with a garment that makes me look that way. Is anyone else with me on the facing hatred? I think the above finish looks so much neater, even if it does take longer. I made a 2 inch hem band to finish the bottom, but couldn’t get decent photos. It’s a good option for when you can’t afford to lose anymore length. It’s nearly finished, and unlike my sad 1940s dress I really love it! I will get photos when I can… right now I can only get them on weekends, as I’m in rehearsal or class most nights.